If you've ever been to Montana, then you’d know that fly-fishing is a very serious matter there. And amidst the legends and lore surrounding this angling mecca, one boat maker has made a name for himself, though decidedly more quietly than others. Situated in a spartan workshop in Paradise Valley, just a few scenic miles outside of Livingston, Jason Cajune is building boats the way they used to; out of wood. Spending much of his childhood in Glacier National Park, Cajune accompanied his step-father as he piloted traditional wooden boats across the various lakes for over 40 years. Originally built in the 1920’s by the Great Northern Railroad, these old-world wooden vessels became his playground, and nautical schoolroom. As a dock boy and “bilge rat,” Jason spent summers painting and varnishing the boats, and by the end of high school, had intimate knowledge of the wooden, plank-and-frame style. After acquiring a degree in architecture, Jason migrated to Olympia, Washington to work for a boat maker specializing in fiberglass and epoxy. It didn’t take him long to realize that it wasn’t for him, and he moved back to Montana for good. Specifically targeting the fly-fishing market, Cajune set out to apply his knowledge of traditional boat building to a clustered fly fishing market. To say it worked would be a dramatic understatement. Before you could say “you’ve got mail,” word got out, a burgeoning business was born, and the rest is highly decorated history. Clients from near and far began to line up; traditional boats for traditional fly-fishermen. “I guess I just made the product that people wanted,” Jason humbly stated as his german short haired pointer ambled about the shop. Often starting from napkin sketches, and the occasional model for a new hull design, each boat is built from scratch using a combination of African mahogany, white ash, white oak, and various fir woods. On average, each boat takes about 300-400 hours of labor. Each boat is unique, shaped to the customer’s taste and needs. Where boats used to start around 10k, with a waiting list of about a year, Jason’s new boats start around 40k, and he estimates that he’s about 5 years out on orders. It takes over a year to complete a boat, and he usually works on multiple boats at a time. “The past few years I’ve done two boats a year, but we did 20 one year when I had help and we were really cranking.” His best guess is that three will launch in 2015, but according to him, it’s really hard to tell a customer a launch date. “Everybody wants everything now, and I’m not really into that. If you want a cheap boat, really quickly, that’s what fiberglass is for. But if you want something that’s handmade and is built to last, well that’s why I’m here. 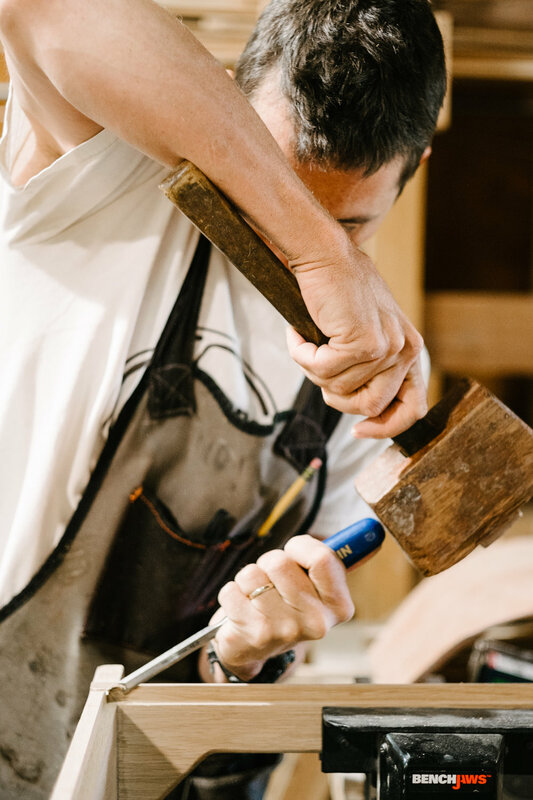 For some reason, people think wood is an obsolete material, and I often have to convince customers that it’s not.” Using only the highest quality materials, the finished vessels are fully functional works of art. Having spent a fair amount of time on Montana rivers myself, it’s not hard to spot one of Cajune’s boats, especially one that has been well oiled. They age beautifully. As Cajune enjoys 20 years of boat making business, he’s almost halfway to that mark of approval. It’s rare that an artist can have such security in their craft, but it seems destined that as long as Montana’s rivers flow, Jason Cajune’s business will grow.